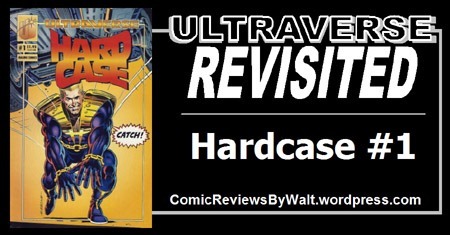 Based solely on memory/nostalgia, even though some part of me recalls Strangers #1 as the first Ultraverse book released, it’s the one I least look forward to (re)reading, putting both Prime and Hardcase ahead of it. When I caught myself reading Hardcase #1 this time through, I was slowing myself down "hearing" the voices from the audio version that I finally gave up and pulled that up on Youtube to have the audio, as I read along WITH it with the comic itself. For this time through the issue, I felt like–as with Prime #1–this really exemplified the ’90s for me. Often, folks point to Image for the ’90s visuals, but as I largely embraced the Ultraverse line over Image, the Ultraverse visuals are imprinted on my own memory and personal "picture" of what a "’90s comic" was. The issue opens a year or so ago on a bloody battle between a group of ultra-humans called The Squad…and the battle is nearly over. We get things from Hardcase’s point of view. He’s injured, and he’d thought he couldn’t BE injured, certainly not this way. 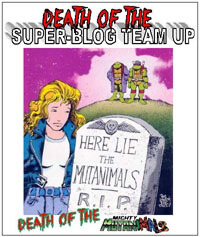 His team is down, and he is just able to get Starburst out of the vicinity of the creature that took the team apart before DJ Blast expends all of his remaining explosive energy at once–the final flash in the pan of the team. Hardcase and Starburst survive, DJ Blast and Forsa are dead…but Hardcase is the only "real" survivor, with Starburst in a coma she may never emerge from. Catching up to the present, Hardcase–Tom Hawke–has retired from the superhero gig and become an actor…though he plays "himself" as a super-hero for the camera. We get a sort of slice of life of that life for him before he finds himself pulled back into action, though it proves too late for a police officer he’d been talking with. Hardcase finds himself in mortal combat with another ultra-human, and lashes out desperately, overwhelmed with guilt and memory of his last encounter with an ultra. Ultimately, he wins his fight, and realizes that he can’t hide behind an acting gig, but has to do "the real thing," so he announces to the world that he’s back. Meanwhile, we get a cryptic scene of some player behind the scenes that has apparently had an extremely long involvement with the direction of events on Earth, and that now with Hardcase back, other ultras emerging around the planet…something must be done! Somehow, I have it in my head that Hardcase was to be the "Superman" of the Ultraverse…though that could just be the cover, of him throwing a car, given the cover of Action Comics #1 introducing Superman with a car lifted above his head, smashing it against a boulder. And in a way, he was. 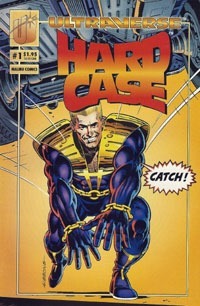 Hardcase is largely invulnerable to normal stuff…but can still be badly injured. He has heightened senses, though he’s not omniscient. He can’t fly–but he can leap long distances. Etc. Different costume, different attitude/portrayal, but very much a similar power set to the original iteration of Superman. That he’s introduced at the end of his time with The Squad–we see the team at its nadir, taken down by NM-E (a large, bulky techno-organic creature very much resembling the Xenomorph from the Alien franchise). As such, we’re plunged into a character’s world with an immediate backstory, more strongly hinted at than shown, but it immediately grounds the character, and puts him in a sort of "senior class" over other characters that we’re about to be introduced to. He’s part of an "earlier wave" of ultras, having been on the scene a at least a year BEFORE the emergence of Prime on the scene, or the Strangers, the Freex, Mantra, Prototype, etc. He’s had his initial journey, his crisis of faith, and now a new inciting incident thrusting him back into the world of the superheroes…though this new phase of his life is a fresh start, fitting of a #1 issue. There’s something to the art of the issue that sits slightly askew to me. It’s not bad by any means, but there’s something slightly "off" to it, and it definitely doesn’t look quite so "refined" as many comics I’m used to reading in 2018, created and published in 2018. Of course, there’s a quarter-century difference in time, and this issue’s art and story are rooted very much in 1993. As said, the overall visuals really embody "the ’90s" to me, as do the character designs. Story-wise, it’s interesting to get the character with all this sort of built-in backstory, conveyed in so few pages. By "modern" standards, the ground covered by this issue would surely be at least a six-issue opening arc of a series. We’re left with plenty of questions and potentials out of this issue; lacking in-depth concrete details of The Squad and such, and it’s rather choppy going from the NM-E battle to news to Hardcase acting a year later, a sort of clichéd interaction with a cop, to a convenient attack of another ultra…but it is a lot of detail crammed into a single issue, setting up the character’s past, present, and future, world-building, and generally serving as the sort of #1 issue I much prefer. It may not quite be a "contained" story, but it sort of gives three stories at the same time; it introduces a lot, and leaves plenty to be expanded on in upcoming issues.